I have already published several posts on irregular verbs: Past participles – divided according to the pronunciation and Present perfect tense. However, a week ago a student of mine contacted me and asked me if I could create a way for him to learn the irregular verbs. He spends a lot of time driving so he asked me to prepare something to listen to in his car. So I did. In this post there are 33 irregular verbs presented in an associative matrix, in mp3 for listening, in mp3 for learning and two games for practising them. 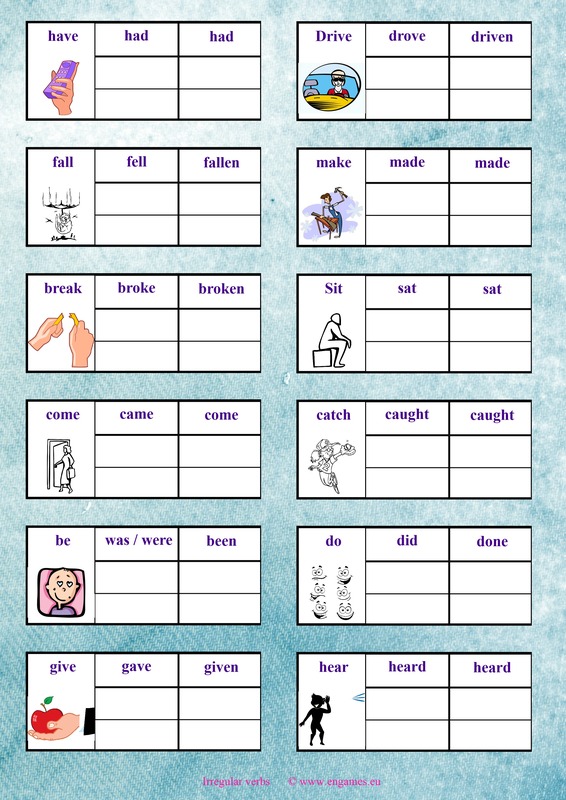 Here you can find two ways to learn the irregular verbs. I have tried both and both work. The first one is called associative learning and you should write two words in your mother tongue under each verb. The words should be similar to the English words and at the same time they should emphasize the differences between the forms. For example Drive – Dr, Iveta DROVE – Dr., ovce, DRIVEN – Dři, venku. Create your own associations and you will see that you will know the verbs quickly. In the second game you should fill in the sentences with the correct words. If you pass the test you can play the game called Math pop and practise your maths at the same time. Im glad to hear like this lessons. So i pleased to ask you to send many more lessons to my email add that can improve my vocabulary . I will be obliged to you sir if you look at my request. A lot of thanks to the creator of this amazing Plan. Coz its so easy to keep in mind. Huge and huge succeses in your inventing! Its a good website. I like it. I will certainly add more irregular verbs soon. I have added the link to the post. Right click the link and download the file. Thank you Zdenda for creating such an amazing and easy way to learn irregular verbs. Please I would like to know if you are an english native speaker or english learner? I am not a native speaker, but I ask the native speakers to do the pronunciation and check some difficult things. thanks for such a good information about it………. Nice of you to have considered visual learning for irregular verbs! Thank you vert much!This Is amazing!